Understanding knitting increases is a vital part of any knitter’s education. Learning what each type of increase looks like and how it functions within a fabric can help you not only to read your knitting better and understand the intentions of the designer, but will also make it easier for you to make your own decisions when knitting a project. In this article, we will look at the most common types of increases and how to plan the placement of increases in your garment. Just as decreases can lean to the right or the left, increases can also have a right and left slant. Thus, it is possible to work increases on each edge of a piece in mirrored pairs. The swatches below demonstrate how increases can be worked on each side of a garment. Instructions are provided for working each swatch. Perhaps the simplest way to add stitches to your knitting is by working a yarnover. The yarnover increase is worked by wrapping the yarn over the right needle between two stitches. This method produces a small hole, or eyelet, in the knitting, so it’s most commonly used in lace patterns, where holes are desirable, or in patterns where the eyelet has a decorative effect. The yarnover increase doesn’t have a slant to it, so the same method can be used at both the right and left edges. Inc row (RS) K2, yo, knit to last 2 sts, yo, k2—2 sts inc’d. Next row (WS) K2, purl to last 2 sts, k2. The twisted yarnover method is a variation of the yarnover increase. It is formed by making a yarnover (or a yarnover) on the row requiring the increase and the yarnover on the following row to close the backward yarnover through the front loop (tfl ) slant; purling a regular yarnover through the give it a left slant. Inc row (RS) K2, yo, knit to last 2 sts,BYO, K2–2sts inc’d. Next row (WS) K2, p1tfl, purl to last 3sts, p1tbl, k2. Another method for creating mirrored increases is the loop method. This is the same technique that can be used to cast on stitches at the beginning of a row or for a buttonhole. Because it uses less yarn than the yarnover method, it produces less space between the stitches. The swatch shows the backward loop increase made on a right-side row within a two-stitch garter stitch border with the increases leaning in the direction of the growing fabric. Inc row (RS) K2, right loop CO, knit to last 2 sts, left loop CO, k2—2 sts inc’d. Next row (WS) K2, p1tfl, purl to last 3 sts, p1tbl, k2. Another approach to increasing involves working into the same stitch more than once. The most common of these is created by knitting into the front leg then into the back leg of the same stitch. This method forms a horizontal bar at the base of the new stitch created (for this reason, it is sometimes referred to as the bar increase). Because the bar falls to the left of the increases, the best way to make the bars align when working the increases in pairs is to work the last k1f&b one stitch further in from the edge than the one at the beginning of the row. This will keep the bar the same distance from the edge. In the swatch, the first increase is worked two stitches from the edge and the second increase is worked three stitches from the edge. Inc row (RS) K2, k1f&b, knit to last 4 sts, k1f&b, k3—2 sts inc’d. Another method for creating an increase out of an existing stitch is the lifted method, which creates a new stitch out of a stitch in the previous row. The swatch below is worked with a right lifted increase (RLI) at the beginning of the row and a left lifted increase (LLI) at the end of the row. Inc row (RS) K2, RLI, knit to last 2 sts, LLI, k2—2 sts inc’d. The Make one increase (M1) forms a new stitch by working into the running thread between two existing stitches. You can determine which way the increase will slant by which way you twist the running thread when you work it, resulting in a make one left (M1L) or a make one right (M1R). The swatches below show increases worked every right-side row inside a two-stitch garter stitch border. The first swatch uses M1R at the beginning of the row and M1L at the end so that the increases slant in the same direction as the growing fabric edge. The second swatch uses M1L at the beginning and M1R at the end of the row to slant the increases in opposition to the fabric edge. Inc row (RS) K2, M1R, knit to last 2 sts, M1L, k2—2 sts inc’d. Inc row (RS) K2, M1L, knit to last 2 sts, M1R, k2—2 sts inc’d. Knowing the basic differences between these methods can come in handy when working with different yarn or different textures. Every yarn shows an increase differently and sometimes you can be surprised by what increase method is the least obtrusive. Often, the increase that produces the smallest hole in the knitting is the most invisible. M1 probably produces the tightest result because you are using yarn from the running thread between the stitches, though depending on the fabric this tightness can make it more or less noticeable. The lifted method is a slightly more relaxed increase and is often regarded as the most invisible method. Tighter is not always better; if the texture of the fabric is already very dense, you may find the increases easier to work and just as invisible if you use a method that produces a looser result, rather than a tighter result. Then again, if you want to use the increase and a decorative element, you may choose another method entirely. As ever, try them out for yourself and see. This article on knitting increases was originally published in the Spring 2017 issue of knitscene. Get helpful tips like this and more when you subscribe to Interweave’s family of knitting magazines! 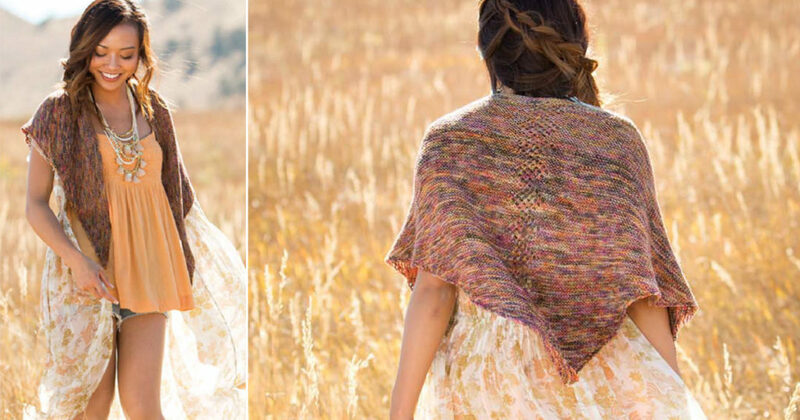 Pictured in our featured image is the Ironwood Shawl by Laura Reinbach. This shawl rates at a level of “easy” and is the perfect manner in which to tackle knitting increases, if you are just getting started. Never miss an issue! Subscribe today!